PS: You can follow Steve on FB! "These feetsies are made for thumping, and that is just what they'll do! 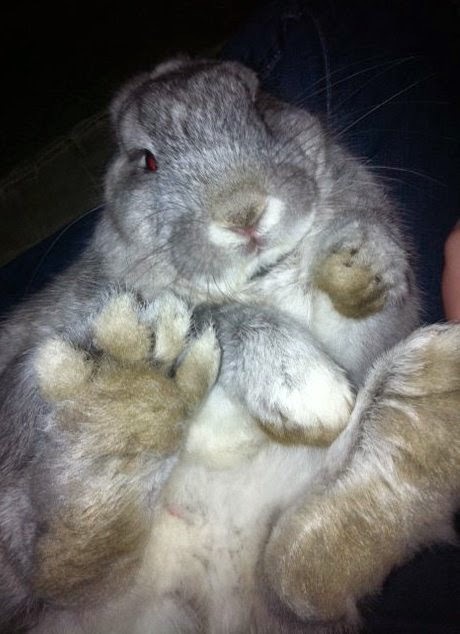 One of these days, these feetsies will thump all over you." However, for the moment, you may kiss them. Heh Heh ... for all the good talking to a rabbit the regular way ever did me ... might as well try it. Officiant: Steve, do you take this hoomin, Isabella, to be your lawfully disapproved of hoomin? Steve: Oh, I suppose so. Officiant: And do you, Isabella, take this Bunny to keep you in your place from this day forward? (Dampened calls for help) Ah, then Isabella you may kiss your bunny's feet. (Officiant is nudged by Steve and told not to remove Isabella's gag until after the feetsie kissing is over. It looks like we're gonna be on the wrong end of a *THUMP!*-ing! Right in our ugly hoomin faces! Well, if there's any damage, or bruising, it will almost certainly be an improvement on our ugly hoomin boats, right, Steve-bun?! Mr. Bun says, train your hoomin right! Mr. Buns says Hoppy Easter Everybun!